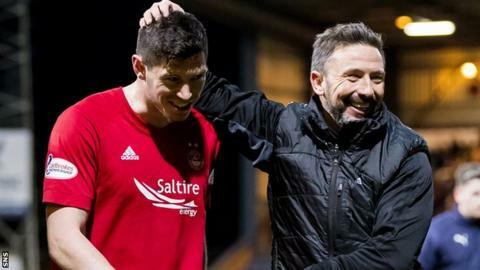 Derek McInnes watched his Aberdeen side beat Dundee in his first game since rejecting Rangers and said he has "nothing to be guilty about". The manager took 48 hours to make his decision after their Premiership rivals made an official approach on Tuesday. McInnes refused to comment on a Rangers statement that appeared to question their former player's ambition. "I feel that I have handled this absolutely fine," he told BBC Scotland after the 1-0 win at Dens Park. "It wasn't a decision I came to lightly. I've still got family who live in the west and lots of things to consider. "I hold Rangers in high regard. I was a supporter, I played for the club and I can't deny that. "In whatever walk of life, when you get the opportunity to consider something, it is important that you take the time to consider it and we felt, the chairman and I, that was what was necessary to do over those 48 hours." McInnes elaborated slightly on his statement to Aberdeen's website explaining his decision to extend his stay at Pittodrie. "It is more than one reason, but for me, I wasn't prepared to rip up a contract and tarnish relationships I've had and built at Aberdeen and continue to have," said the 46-year-old. "We've developed that and fostered that over a period of time, both players and staff, and supporters, but also the chairman as well. "There were plenty of reasons to stay and I stayed. "Ultimately, I am still the manager of Aberdeen and I like my job at Aberdeen and it's very important to me. "I am a very confident manager, I believe in my team and believe in myself and, if I keep doing my job well, there may well be opportunities in the future." Amid reports that McInnes was Rangers' target to replace the sacked Pedro Caixinha, Rangers defeated Aberdeen twice to overtake the Dons on goal difference behind leaders Celtic in the Scottish Premiership. McInnes recognised that some fans had concerns about him being linked with the Ibrox job, but he was not worried about their reaction because "fans just want to see a winning team". "Rangers played very well in the two games," he said while admitting the speculation had affected his side. "It wasn't just about us not playing as well as we could. "But we wanted to make sure it was a more altogether performance and I think we got that. "It wasn't easy. I think Dundee are a decent team and Neil's got them going well and it was hard fought." McInnes thought his side deserved the win that takes his side to within four points of Celtic, who face Hibernian on Sunday. Dundee slip to 10th, behind Kilmarnock on goal difference, but counterpart Neil McCann had no complaints about his own team's performance. "I'm disappointed for them that we didn't manage to get something from the game," he said. "I think we deserved it. "I think we forced Joe Lewis into two quite special saves - one of them in particular from Roarie Deacon looked as if it was in all the way. "On the whole, they've been exceptional in terms of their desire to work - not in terms of their acceptance to work. "They want to work to put things right. Over the last three, four games, I think the performances have been there for everyone to see, that they're maturing as a team, they're getting better, they're gaining character and that will do us well in the coming months." McCann and Aberdeen assistant Tony Docherty clashed at full-time, but the Dundee boss brushed off the episode, joking he was upset he had not yet received a Christmas card from Docherty. "I just told him, 'I'm not happy, get it over and I want a selection box as well'," added McCann. "A wee bit of frustration, but that's the passion of management."